This is our 3 month old German Shepherd Dog puppy, Zeke. He is a smart, funny, loyal and loving boy who has become the light of my life. 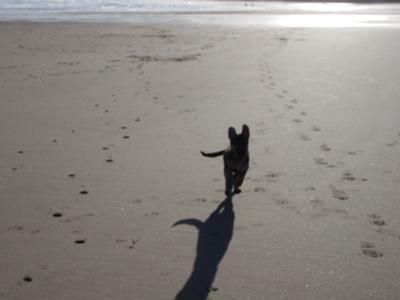 This is the first time he has been to the beach and he had a wonderful if very tiring time. He wasn't too keen on the sea at first but he was beginning to be brave by the end of the afternoon. He had a great time exploring the rock pools and made us all laugh when he pulled out a 4 ft length of sea weed and proceeded to drag it along the beach. We will definitely take him back soon.